As a generalisation Japanese homes tend to be smaller than western one. There will be less rooms and each room may be smaller than their direct western counterpart. This has the effect of requiring the family to be more practical in use of space, one approach to which is how everyone may share a single bedroom together. The phrase for this is called kawa-no-ji and comes from the kanji character for a river which is three vertical lines spaced closely together. 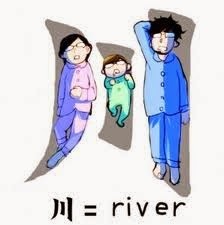 In other words it is showing how the character for "river" looks similar to the parents sleeping with a child between them. Although the name stays the same, as more children arrive the family will continue to share the room into their teens. The interesting thing for me is that, as any parent who has ever allowed their children to sleep with them at night knows only too well, that the child will sleep any direction other than that of the parents. But it does mean that the family wakes up together every morning.